Use custom t-shirts to raise money and fundraising projects. Custom printed fundraising t-shirts are a great source for making money for a cause. They also make great incentives in obtaining memberships or participation in things like camps, vacation bible schools, and various events. Everyone likes to feel like they are getting something for their money and a custom t-shirt with your message is a great product. When it comes to custom printed fundraising t-shirts people are getting something for donating their hard earned money. When they receive a custom t-shirt for their donation the purpose is twofold. First they are getting something “free” in return for their donation and second, the t-shirt they are receiving has the message and the purpose for your fundraising on it which just creates more awareness. Schools use custom t-shirts as a give away to kids participating in their sports camps. They’ll state registration includes a t-shirt or a free t-shirt. Well we know the t-shirt isn’t actually free as it’s built into the cost of the camp. Regardless, in addition to the fun the camp provides and the skills you’ll learn during the camp, you’ll walk away with those skills and a t-shirt stating you participated in the camp. So it’s a great promotional piece for the camp and at the same time a bonus to the campers as well all know kids like wearing t-shirts. Custom printed fundraising t-shirts are very cost effective and the ROI on t-shirts is enormous. The concept certainly works better with larger fundraising efforts where the volume of shirts needed is high. This lowers the cost of the shirts making the dollar amount going towards fundraising higher, but it means you are reaching a broader audience so the potential is much higher. Kirkwood Trading Company in Saint Louis has been screen printing custom t-shirts for over 20 years. In that time we have printed thousands upon thousands of t-shirts for various fundraising organizations. Those few thousands of t-shirts have yielded tens of thousands in donated money. So custom printed fundraising t-shirts work whether it’s to raise money for cancer, funeral costs, a foundation, sports team, or anything else where fundraising has been essential. 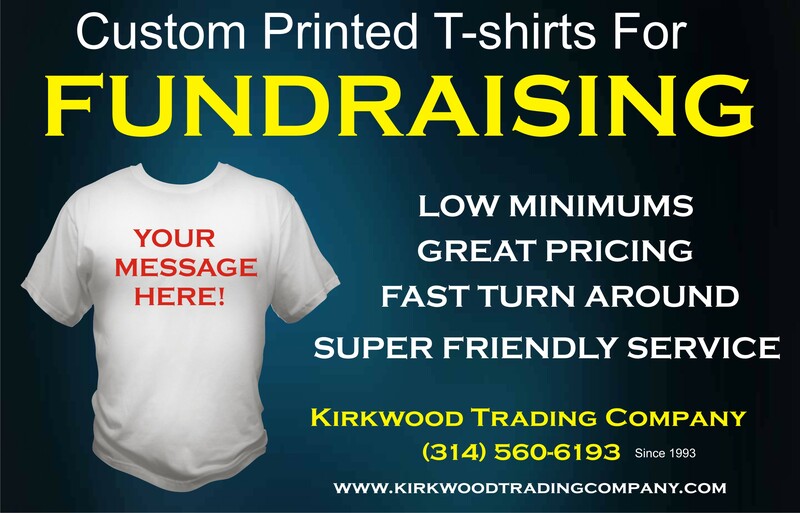 If you are interested in learning more about custom printed fundraising t-shirts give us a call and we’ll be happy to take a look at your needs.